An article signed by journalists of the newspaper in Colombia and New York states that the video ‘casts doubt’ on the culpability imputed to Venezuelans. Senior US officials said Nicolás Maduro‘s regime burned an aid convoy last month. Our exclusive video contradicts that claim and shows how this unverified information was spread through Twitter and television, the Times says. Vice President Mike Pence wrote that ‘the tyrant in Caracas danced’ while his henchmen ‘burned food and medicine’, says the New York newspaper. The State Department published a video that said Maduro ordered the trucks burned. And Venezuela’s opposition has halted images of burning aid, reproduced on dozens of news sites and television screens throughout Latin America, as evidence of the alleged cruelty of the Venezuelan leader, the newspaper said. The unpublished images obtained by The New York Times and the previously published films, including the images shown by the Colombian government, which blamed Maduro for the fire, allowed a reconstruction of the incident. He suggests that a Molotov cocktail thrown by an anti-government protester was the most likely trigger for the fire, he stresses. Describes the publication that at a given moment, a homemade bomb made of a bottle was thrown at the police blocking a bridge that connects Colombia and Venezuela to prevent the aid trucks from arriving. But, the rag used to light the Molotov cocktail is separated from the bottle by flying towards the help truck. Half a minute later, that truck is on fire, he details. The same protester can be seen 20 minutes earlier, in a different video, hitting another truck with a Molotov cocktail, without setting it on fire, he adds. 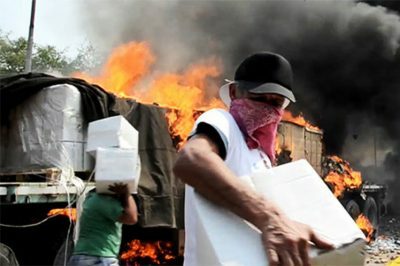 The burning of the aid last month, reason for a broad condemnation to the Venezuelan government, arguments that today arouse doubts and that the video attributes to people linked to actions that the White House promoted to justify an aggression against Venezuela. The Times article questions the validity of several of the arguments used to attack Maduro’s government, including actions to prevent the entry of drugs. The Times notes that the United States Agency for International Development, the main provider of aid on the bridge, did not include medicines among its donations.